Makepeace Island is the luxury all-inclusive resort you've never heard of. To pretty much every man and his dog, Necker Island is a household name. The luxury residence nestled somewhere in the middle of the British Virgin Islands has recently undergone a huge facelift following its destruction from a hurricane a few years back. Despite all the hype and the press from the Northern Hemisphere&apos;s party hot spot for the rich and famous, a much lesser known (none of us in the BH office had even heard about it) tropical locale on the opposite side of the globe lies quietly somewhere on Australia&apos;s own Sunshine Coast. Yes, in our own backyard. Surprised? So were we. 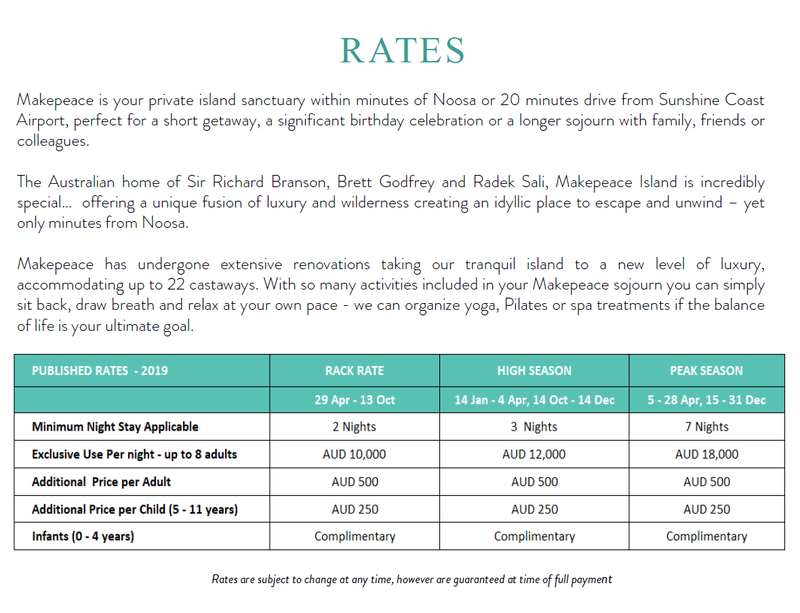 It&apos;s called Makepeace Island, and it&apos;s well and truly open to the public, albeit tailored towards those with deep pockets and marketed for exclusive use only. By exclusive use, we mean you need to rent out the entire island at a time - that&apos;s a total of 22 guests spread across three oversized luxury villas, four spacious rooms and a boathouse. You know what they say, if you&apos;ve got to ask how much it costs, you probably can&apos;t afford it. A quick glance of their rate card will affirm that logic. The 11,000 sq-ft heart-shaped island was originally Branson’s private retreat Down Under, along with partners Brett Godfrey (co-founder of Virgin Australia) and friend Radek Sali (chairman and founder of investment group Light Warrior). That was until 2011 when a facelift converted part of the island to a private resort for the well-off customer from Australia or around the world. Check out the island more closely in the gallery below, then head to their website to inquire about availability.